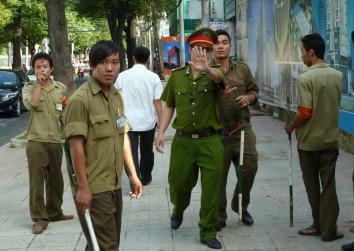 Vietnam bans sharing news online, continues arresting bloggers. A policeman tries to stop a foreign journalist from taking pictures outside the 2011 trial of Pham Minh Hoang, a French-Vietnamese lecturer and blogger. To say Vietnam has a troubled relationship with the Internet would be an understatement. Despite government efforts to repress it, social media, especially Facebook, is immensely popular in Vietnam, with an estimated 70 percent penetration of the total Internet-using population. (About one-third of Vietnam’s 90 million people are online.) Like many countries, Vietnam is apparently trying to incubate its own Silicon Valley, and there are homegrown social media sites like Zing Me and HaiVL. But authorities have so far been unable to replicate China’s Great Firewall to block content unfriendly to the regime, and have been cracking down on online dissidence the old fashioned way—harassment and arrests. In other words, “shoot the messenger,” according to Phil Robertson, deputy Asia director for Human Rights Watch. It’s estimated that Vietnam has imprisoned 46 bloggers and activists so far this year, second only to China, and it’s ranked 172nd out of 179 countries in the Reporters Without Borders Press Freedom Index. The regime’s desire for strict control of online information flares regularly. In October, on the same day that a Vietnamese man was convicted for Facebook posts that called for the release of his brother, another activist took to Facebook to broadcast news of his detention by police. Dinh Nhat Uy’s campaign for the release of his brother, a jailed activist, resulted in a 15-month suspended sentence for four Facebook posts in which he was “abusing democratic freedoms”, according to Reporters Without Borders. Meanwhile, friends of pro-democracy blogger Nguyen Lan Thang posted a video on Facebook after he was detained at Hanoi airport, in which he stated “When you see this video, it’s certain that I have been arrested by security forces.” Earlier this year, American officials made their displeasure known when a US-trained human rights lawyer and popular blogger, Le Quoc Quan, was sentenced to a 30 months in jail, on tax charges believed to be politically motivated. Perhaps most astoundingly, in an effort to protect the power of state-run media and crack down on the sharing of controversial views, Vietnam has passed a decree banning the sharing of news online. The law, which came into effect in September, makes it illegal for social media users to post information gathered from almost all news sources in the name of “national security” and preventing copyright infringement. For the average American, whose Facebook feed is stuffed with angry uncles posting Fox News videos about Obamacare, the possibility of being arrested for sharing news clips would be shocking. It also doesn’t bode well for Vietnam’s Silicon Valley attempt. But as more and more Vietnamese go online, the ability of the government to ensure that its citizens find only “correct and clean information on the internet” cannot be long for this world.